Rebel Records has released of The Blues Are Still The Blues, a retrospective containing 15 songs selected from the four recordings made by The Traditional Grass for Rebel between 1992 and 1995. The collection was produced by Rebel’s David Freeman along with original band members Joe Mullins and Mark Rader and reflects their keen understanding of the band’s style, its mission and goals within the bluegrass environment of the period. The album is now available via iTunes, Amazon, and other online and retail music stores. For twelve years, The Traditional Grass delivered powerful bluegrass in the same vein as the genre’s founders. While they drew great inspiration from first generation ‘grassers such as Flatt & Scruggs, The Stanley Brothers, Jimmy Martin, Reno & Smiley and The Osborne Brothers, what made The Traditional Grass unique was their refusal to remain complacent. The band’s premiere lineup―Mark Rader (guitar & vocals), Joe Mullins (banjo & vocals), Paul “Moon” Mullins (fiddle), Gerald Evans, Jr. (mandolin, fiddle & vocals) and Mike Clevenger (bass)―brought a freshness to traditional bluegrass that prevented the style from going stale. The Traditional Grass’ original songs proved to be some of their most enduring: “The Blues Are Still The Blues,” “A Broken Heart Keeps Beatin’” and “Lazarus” appear on this collection, while “Hard Times, Some Times,” “Lord, Lead Me on Home,” “Rest For His Workers” and “Be True to Yourself” are just a few more of the many original songs which the band contributed to the bluegrass portfolio. At the same time, the group was intent on recording obscure material from bluegrass music’s early days – examples here include “She Has Forgotten” and “It’s Grand to Have Someone to Love You” (Reno & Smiley), “The Shuffle of My Feet” (Hylo Brown) and Gonna Lay Down My Old Guitar (The Delmore Brothers). 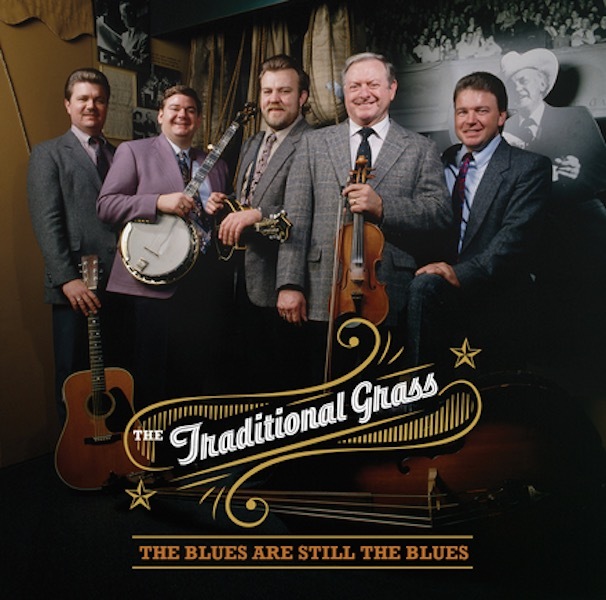 The Traditional Grass’ connection to the classics was fueled by more than just appreciation; Joe’s father Paul “Moon” Mullins had performed with the Stanley Brothers in the late 1950s and was a founding member of The Boys from Indiana. Through his radio programs Paul had direct contact with nearly everyone in the business, from Bill Monroe and The Osborne Brothers to Jimmy Martin and Red Allen. Although active for only a dozen years, the music performed by The Traditional Grass is as powerfully significant today as it was when they were on the circuit. Several of the band’s songs have been re-recorded by such high-profile artists as Dailey & Vincent, Adam Steffey and Brandon Rickman to name a few, while others have become jam session favorites, heard at bluegrass festivals nationwide. The Blues Are Still the Blues by The Traditional Grass is a wonderful example of how great music was achieved when the roots were firmly in place and honoured, but the branches were vibrant with new growth.